Lisbon has great waves on its doorstep, waves that will work nearly all year-round and are within 40 minutes of the city centre. Lisbon is a great base for a surf holiday, aside from surf you have the city of 7 hills to explore, the Oceanarium, Sagres national park, nearby towns such as Ericeira & Cascais (great day trips). 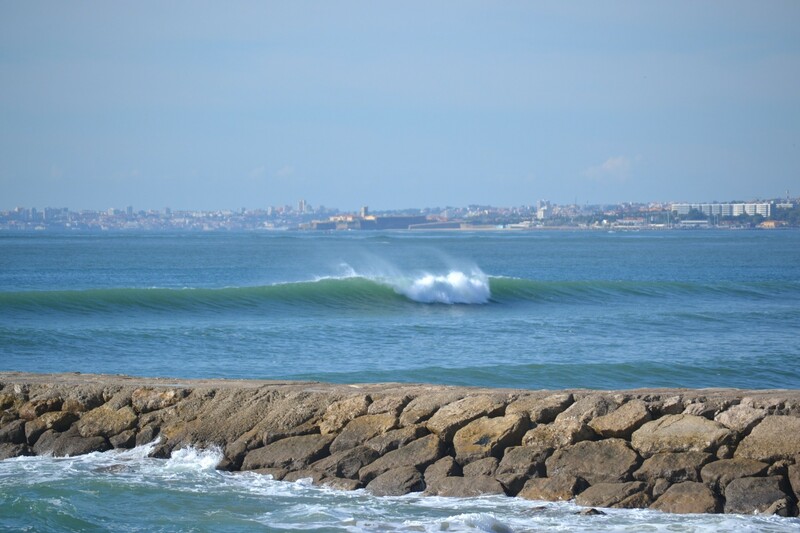 All around the city there is a huge variety of waves and surf spots, many world famous such as Carcavelos surf beach. There are a variety of waves on offer too, from beach breaks, point breaks to reef breaks. Staying at a Lisbon Surf Camp and checking out the many surf options in Lisbon is something everyone should do at least once. Carcavelos surf beach is one of the best known surf spots in the Lisbon area and in Portugal. 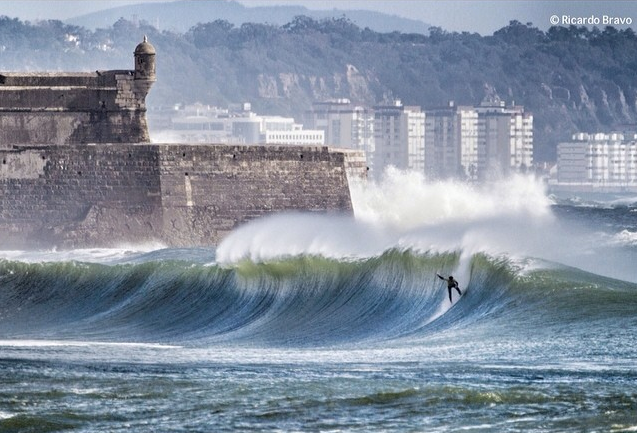 It is 10 minutes drive from Lisbon city centre and gets consistent waves most of the year. It works best on South Western ground swells with a Northern offshore winds. Carcavelos offers many peaks and is good for all levels, with lots of local surf schools offering equipment and surf lessons. After a surf at Carcavelos you can sit back and watch the sunset and a number of cafe's and bars on the beachfront. 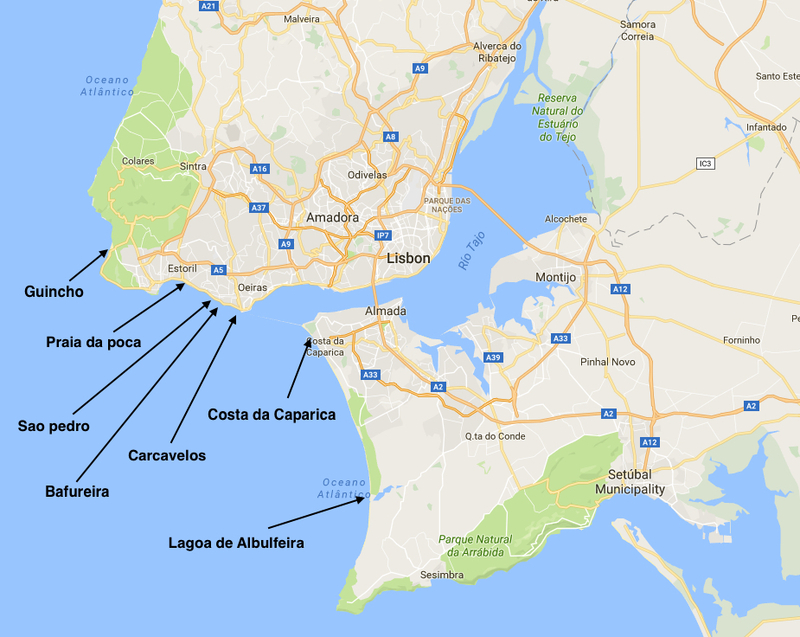 Getting to Carcavelos is very easy from Lisbon by train or car. Costa da Caparica is a long exposed beach with jetties all along it to the South of Lisbon across the Tejo river. It is a 20 min drive across the bay on the opposite side of the city. The stretch of beach gets swell and surf all year round as it is so exposed and works brilliant when winds from the East appear, giving it a perfect offshore wind. Caparica has rights and lefts that break at different stages on the beach allowing for options all along the 30km stretch of beach. Some of the best waves are on the Northern end of the beach where the sand bars build up near the jetties. 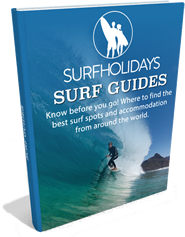 There are lots of Lisbon Surf Schools in the area so getting rental equipment and lessons is easy. This stretch of coast offers so much and all within easy view of Lisbon city. 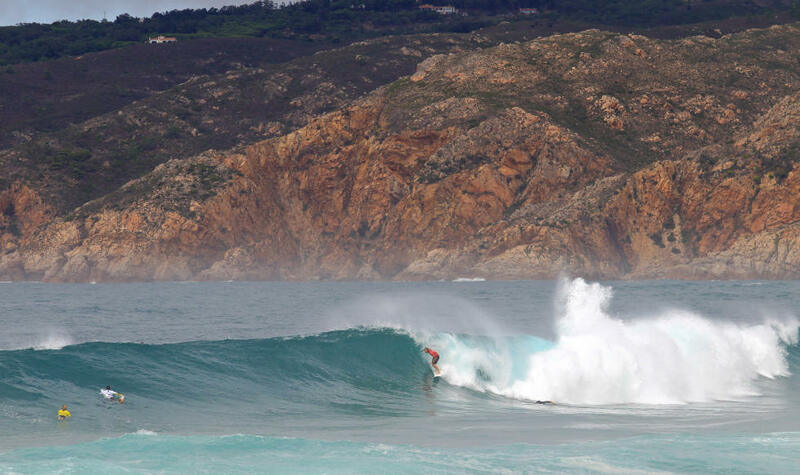 Located 20 km west of Lisbon city centre by train, Poca is a reef break that can take some very large swells and lights up in South West swells with North winds. The wave can be heavy and works best on a mid tide. When Poca starts to work it is only for the intermediate to advanced surfers and has even been nicknamed the Portuguese Teahupoo. 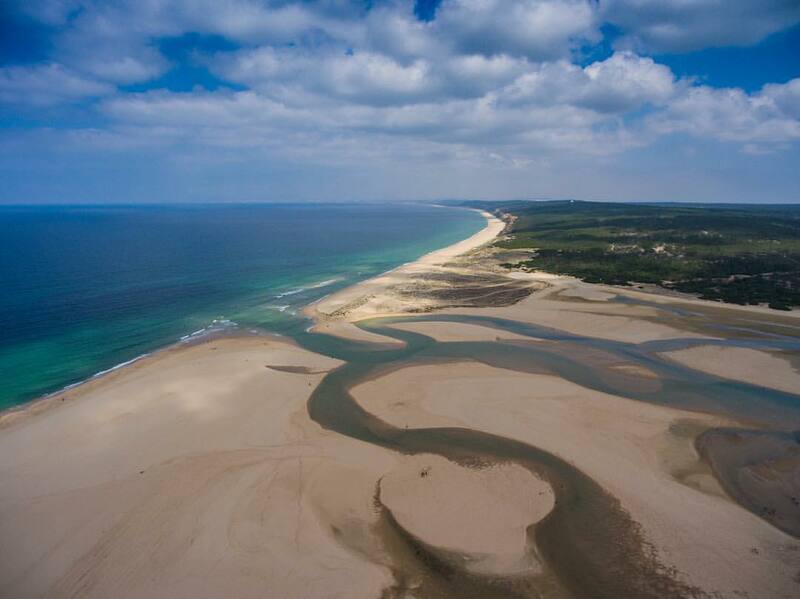 Directly South of Lisbon is Lagoa de Albulfeira, about 20 km. This wave is a sandbar and is very exposed to swells meaning it is can have waves all year round for waves. It has a great right breaking wave when the lagoon is connected to the sea, which sets up the sand bars nicely. The wave can hold swells that are small all the way up to 3m. If its a big open beach with lots of wave options you want ,this wave is great. The location is gorgeous, one of our favourite Lisbon surf spots and a great place to just kick back on the beach in-between surfs. One of the best waves on the Estoril coast just West of Lisbon, Bafureira is a great reef break that works most of the year. It can work on both ground swells and wind swells and with some North in the winds. Mid tide is when best to surf Bafureira and it can produce both right and lefts in the right conditions, but is known more as right breaking wave. If you get the right conditions and get a surf there you will not be disappointed. On the West coast, 30 mins drive from Lisbon is Guincho beach. This beautiful long 1km beach is one of the best beach breaks in the area. Summer is nice and mellow, outside of this it can get punchy. You can get great rights off the cliffs to the North in the right swell. It is a bit exposed and from mid afternoon onwards can get windy and attracts kitesurfers. Its a great summer beach as it will get most swells in the area and can work from small to very large in size. It has a few surf schools operating on it for lessons and equipment. Best of all is Bar do Guincho, after a long day in the waves you can kick back with some great food and drink while watching the sunset on the beach. overlooking the beach. This point break is a great wave to surf and with the right conditions can be a wonderful wave to surf. It mostly works on South Western swells but can also work on very large North Western swells that get around to it. It is really relaxed to surf and when its working great can give a long ride. It is also great for all levels and works best on the rising tide. Lisbon is thriving European city at the moment with its vibrant young population. Lisbon began hosting the Web Summit in 2016 which brought up to 50,000 tech people to city. It is relatively inexpensive to visit, has some fantastic restaurants & bars and most importantly is close to some of Portugal's best surf. Having surf so close to a city is pretty unique, so to help you, that's why we have we ranked the top 7 Lisbon surf spots above.